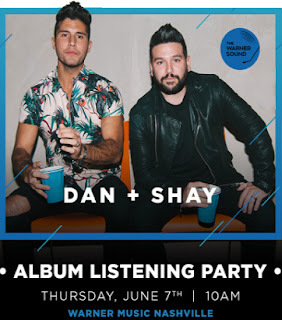 Dan + Shay to Host Album Listening Party During CMA Fest! Dan + Shay will hold an Album Listening Party at Warner Music Nashville - 20 Music Square East on Thursday, June 7, 2018 at 10 AM during CMA Fest week! Tickets for an album listening party bundle are on sale for $124.99 and include a meet & greet with Dan + Shay, photo opp, limited-edition merchandise, event laminate, Dan + Shay CD, Dan + Shay Digital Album, Tequila Digital Single, All To Myself Digital Single, Speechless Digital Single, Tequila Coffee Mug, Song Icon Enamel Pin 11-pack, and T-Shirt.